I think we can definitely declare success with the Thunderclap! Final count was 547 supporters, 191,470 total reach and in the first two hours after the Thunderclap went out there were 1,147 hits on the website. Now we need to translate that success into actual letters sent. Any thoughts? To paraphrase Lorien, it's easy to find something worth clicking for, do you have anything worth writing for? Almost by accident, I've created a shop at CafePress with a bunch of items with the #FreeBabylon5 logo. There should be a buck or two from each item sold coming to the campaign so I hope you might find something you like. Plenty to choose from, not just t-shirts (dog hoodies, tea pots, shower curtains, golf balls....lots of variety!). "This show is a semi-forgotten gem that badly deserves new life in HD. 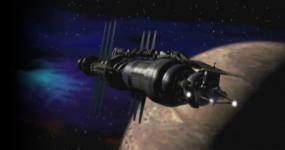 Babylon 5 was again shot on film, and its creators even protected the image for future widescreen presentation. But while the show almost single-handedly pioneered the use of CG-based visual effects in TV (and won an Emmy for doing so), the technology used was primitive by today’s standards. Amiga-based Video Toasters anyone? If this was remastered for HD, with updated visual effects, it could be a real stunner on Blu-ray." This is the sort of thing that everybody in every country can participate in; in fact, the more the better! Warner Brothers has a history of using Babylon 5 to test out new techniques. Redoing the CGI so the show can be issued as Blu-Ray sounds like the latest 'new technique. Previous experiments include issuing the episodes in a season on DVD rather than individual episodes. Lots of fans expressed interest in the swag I had available at Space City Con in January and I promised to make it available if I could. I've got some 'diplomatic pouches' of Free Babylon 5 goodies available on Ebay now. Your information will never be sold or spammed! Just to update this thread a bit, the big news is that #FreeBabylon5 will be making an appearance at San Diego Comic-Con next month with a panel. This is huge since I'll now have access to the freebie tables with the potential of reaching many of the 130,000 attendees. And if you're coming to Comic-Con, I hope to meet you! Jan Schroeder (freebabylon5.com) and Jon Del Arroz (flyingsparkscomic.com) discuss a growing fan campaign that sprang up after J. Michael Straczynski tweeted the hashtag #FreeBabylon5 and urged fans to "get organized and loud" if Babylon 5 fandom is to grow. See what has been accomplished so far and help brainstorm what can be done in the future to promote this seminal science fiction show and bring it to new viewers. Members of the iconic show's art department, under production designer John Iacovelli, with art director Mark-Louis Walters, art director Roland Rosenkranz, graphic artist Alan Kobayashi, and concept artist and set designer Timothy Earls, reunite to discuss how they were able to design 110 episodes over five years and six TV movies while keeping the sets fresh, exciting and, well, out of this world. Comic-Con special guest JMS is having a Renaissance (much as the European Renaissance followed the Black Plague, but you didn't hear that from us). His Image-based imprint Joe's Comics has produced such titles as Dream Police, Sidekick, Ten Grand, and The Adventures of Apocalypse Al, alongside writing a Terminator maxiseries for Dark Horse and a Twilight Zone maxiseries for Dynamite. His new TV series Sense8 (written and produced with the Wachowskis) began filming this past June for Netflix via Studio JMS, and he has four new TV series in development, in addition to writing the new Shadowman movie for Valiant. Get the latest news on secret upcoming projects, a sneak peek into the production of Sense8, and other surprises. Even if you can't go, please help spread the word about the #FreeBabylon5 panel as widely as you can. SDCC pays close attention to attendance and ours is the first one on the first day when a lot of people will still be picking up their badges.